Dermatofibromas also called benign fibrous histiocytomas. The skin has different layers, including the subcutaneous fat cells, dermis, and epidermis. When certain cells inside the second layer of skin (the dermis) overgrow, dermatofibromas can develop. The lesions have an ‘iceberg’ effect in that they feel larger than they look. It certainly does contain many spindle-shaped and banana-shaped mononuclear cells, which may be fibroblast derived, and there is a variable amount of new collagenous dermal connective tissue. There are also many histiocytic cells present, which often contain lipid or iron pigment, both of which may derive from the large number of small blood vessels also contained in the lesion. Dermatofibroma is a harmless, rounded non-cancerous bump. Dermatofibromas are harmless growths within the skin that usually have a small diameter. They can vary in color, and the color may change over the years. Dermatofibromas are firm to the touch. 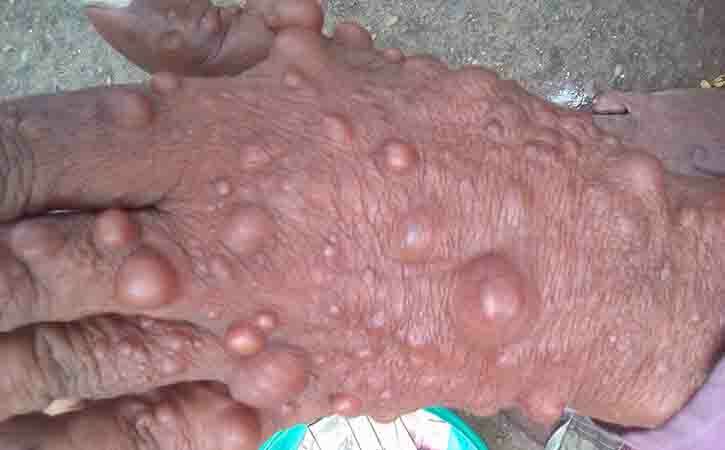 These growths, called nodules, can grow anywhere on the body, but are most common on the arms, lower legs, and upper back. They are very dense, and many people say they feel like a small stone underneath or raised above the skin. Most dermatofibromas are painless. Some people experience itching or irritation at the site of the growth, as well as tenderness. Dermatofibromas rarely cause additional symptoms. The growths typically have some defining characteristics that can help identify them. Appearance: a round bump that is mostly under the skin. Size: It usually remains stable. They are usually between 7 to 10 millimeters in diameter, although they can be smaller or larger than this range. Color: pink, red, gray, light brown or purple in varying degrees, and may change over time. Location: most commonly found on the legs, but sometimes on the arms, trunk, and less common elsewhere on the body. Additional symptoms: usually harmless and painless, but occasionally may be itchy, tender, usually firm to the touch, painful, or feel inflamed. Dermatofibromas are an accumulation of extra cells (an overgrowth of a mixture of different cell types) within the deeper layers of the skin. The reasons why this overgrowth occurs aren’t known. People with suppressed immune systems (old age) may be more likely to experience dermatofibromas, and may have more than one growth. 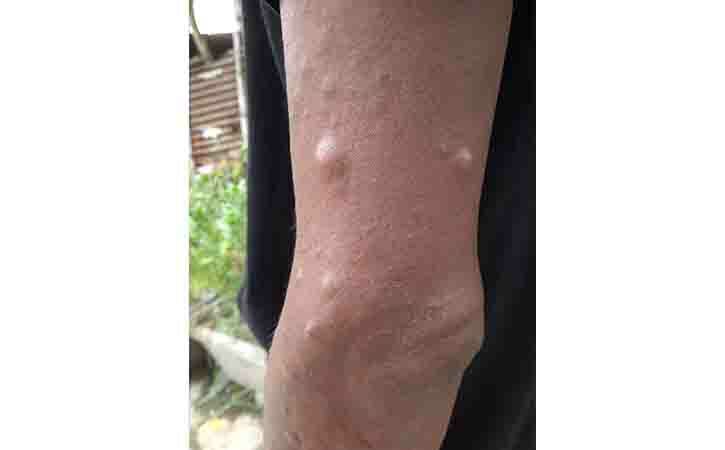 Multiple dermatofibromas are especially common in people with systemic lupus. Most dermatofibromas do not require treatment. They can be safely left alone and will usually cause no symptoms aside from their appearance on the skin. However, some people still choose to remove them. Removal is especially common if the growth is unsightly or in an embarrassing place. Typically, dermatofibromas are chronic and don’t spontaneously resolve on their own. Because they are harmless, treatment is usually solely for cosmetic reasons. Treatment options may include removing the dermatofibromas, shaving it, or freezing it. In most cases, this will leave a scar. Occasionally, a growth may shrink or disappear on its own, but this is rare. Treatment options for dermatofibromas include a laser therapy. If it concern for cosmetic purpose, then need to visit a dermatologist. Removing these growths at home should not be attempted.